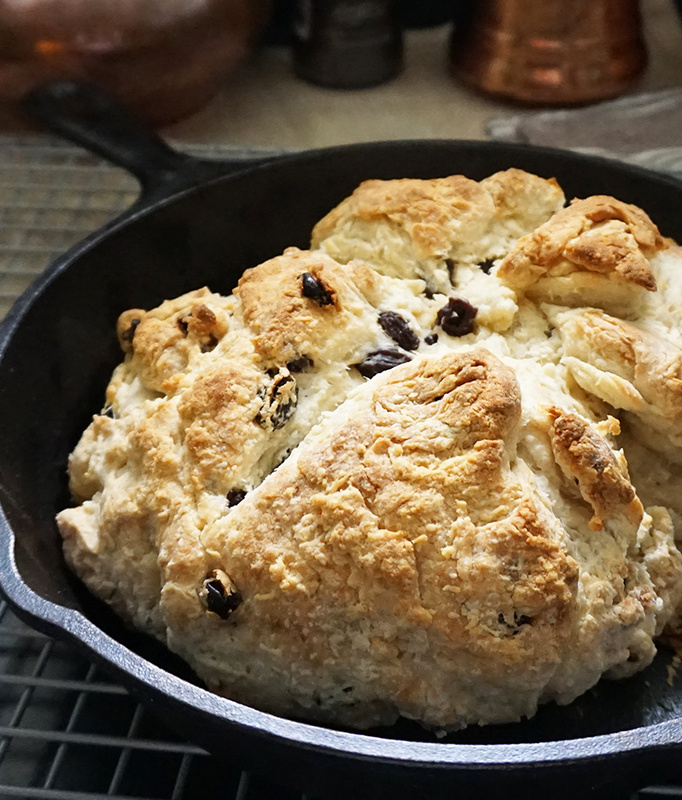 I’m very Irish, to which my milk bottle legs will attest, so St. Patrick’s Day is a holiday where I have some fond food memories, including Irish soda bread. 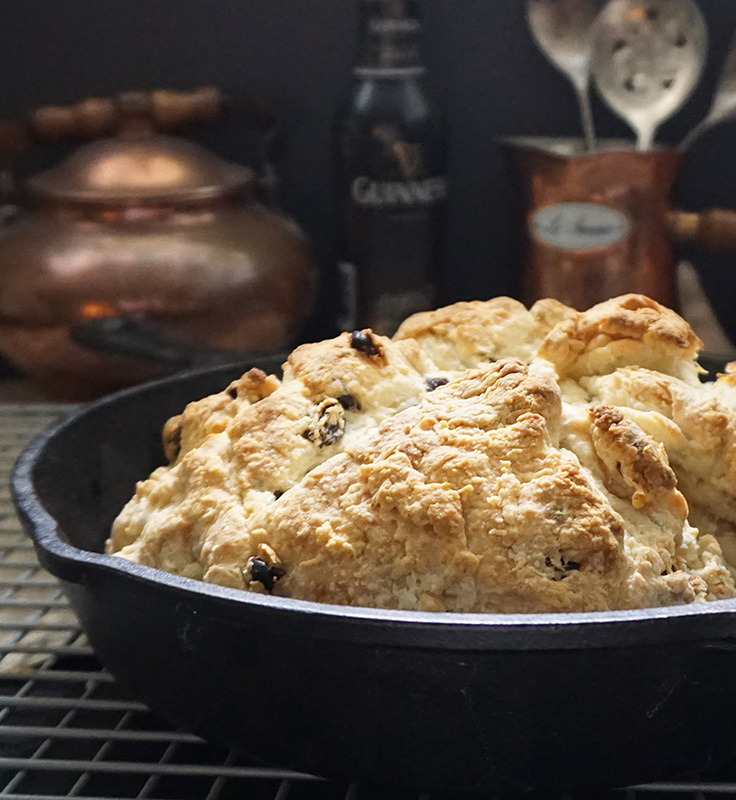 Corned beef and cabbage was our holiday meal (always turned into bubble and squeak the day after), but Irish soda bread was always my favorite. 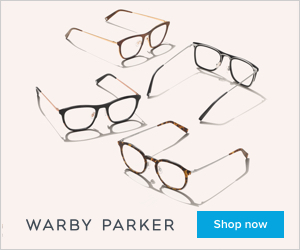 The carb queen still reigns (though it mostly gets given away, thankfully). 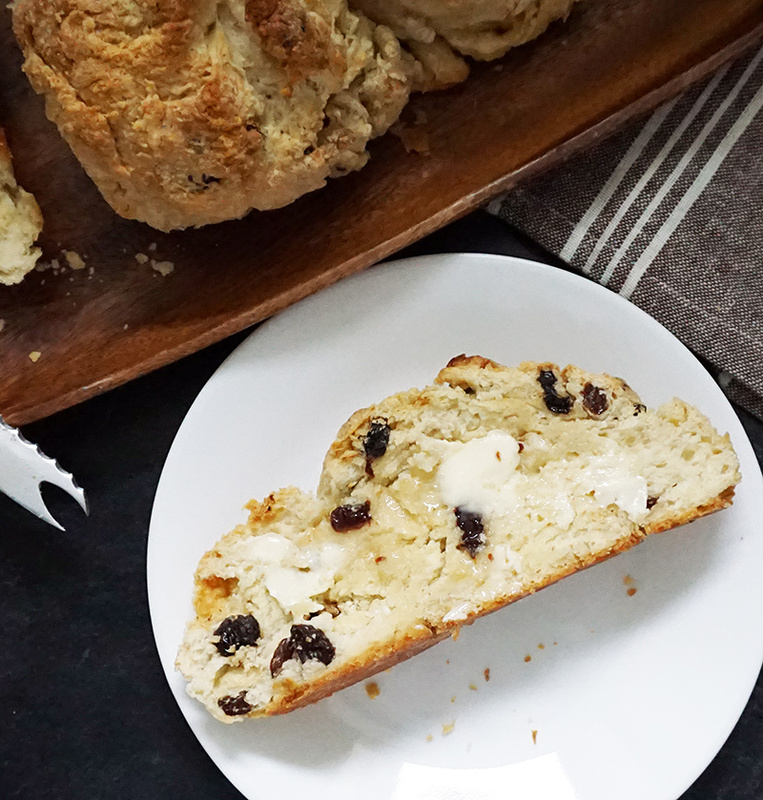 Testing this Irish soda bread recipe was a challenge, but a delicious challenge. I made three loaves for testing purposes, all using fairly different variations of recipes. The final result was my preferred kind of medium density, quite a bit of crumb, and a good amount of softness. 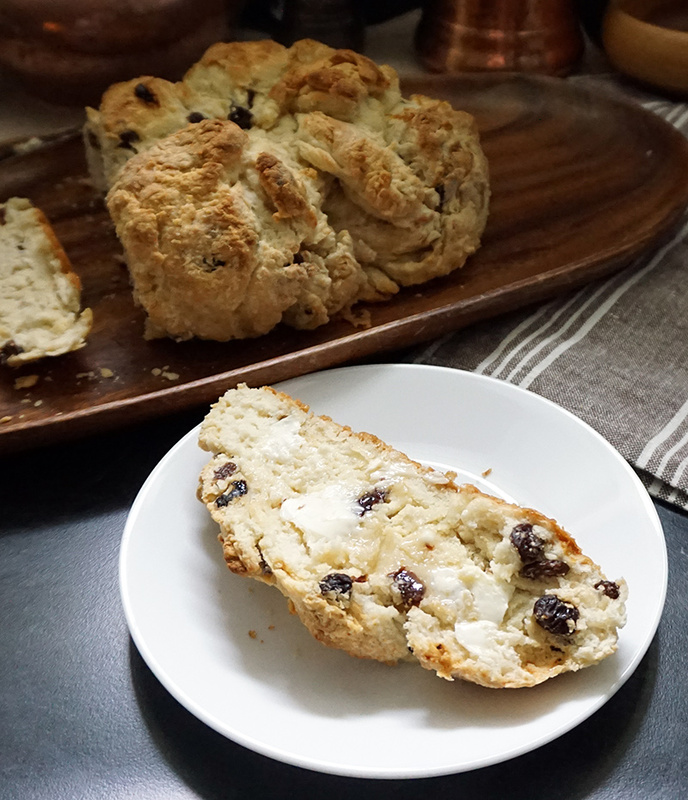 I swapped one cup of all-purpose flour with one cup cake flour, which gives it a little bit of a lighter feel, and it’s reminiscent of traditional quick soda breads. 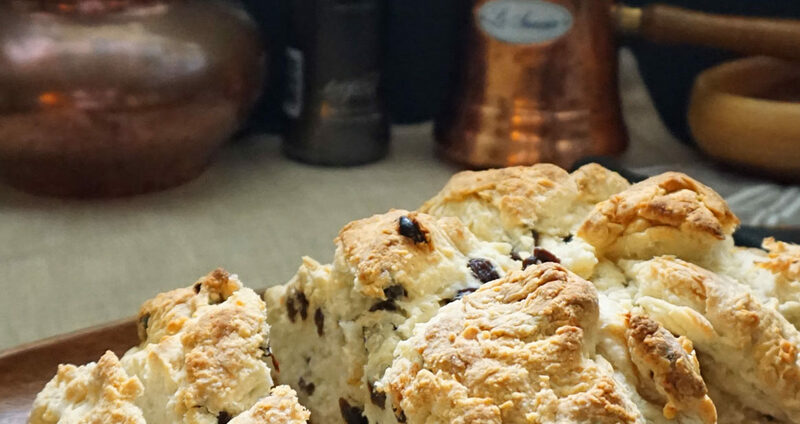 Nowadays most recipes add in butter, which isn’t traditional, but so much yummier. 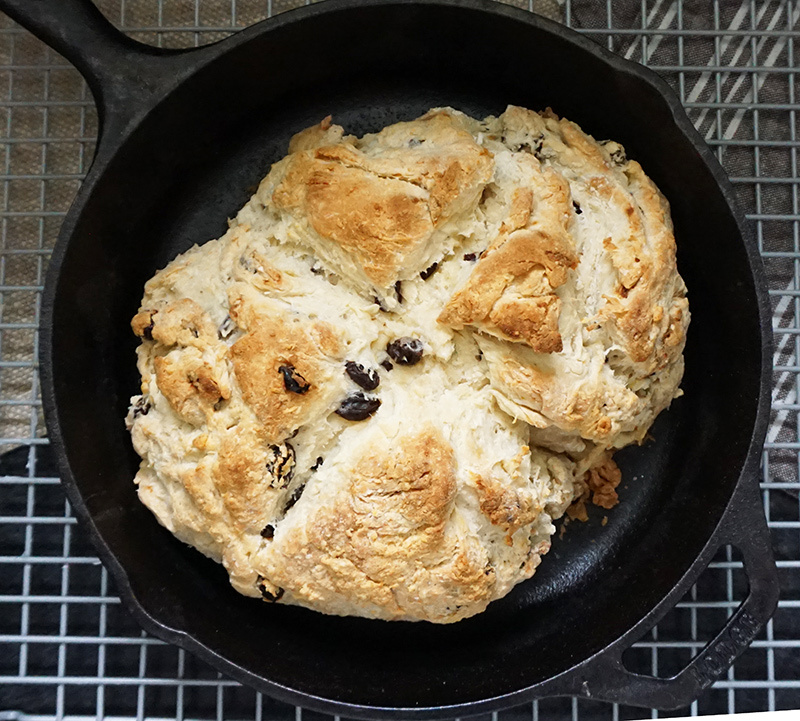 I also decided to make it in my Lodge cast iron skillet, a la this Martha recipe. You can totally just line a regular baking sheet with parchment, though, if you prefer. 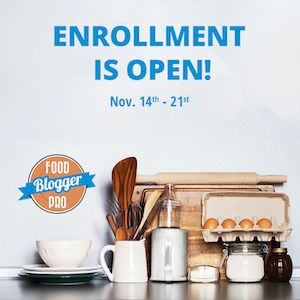 Your results will be mostly the same. 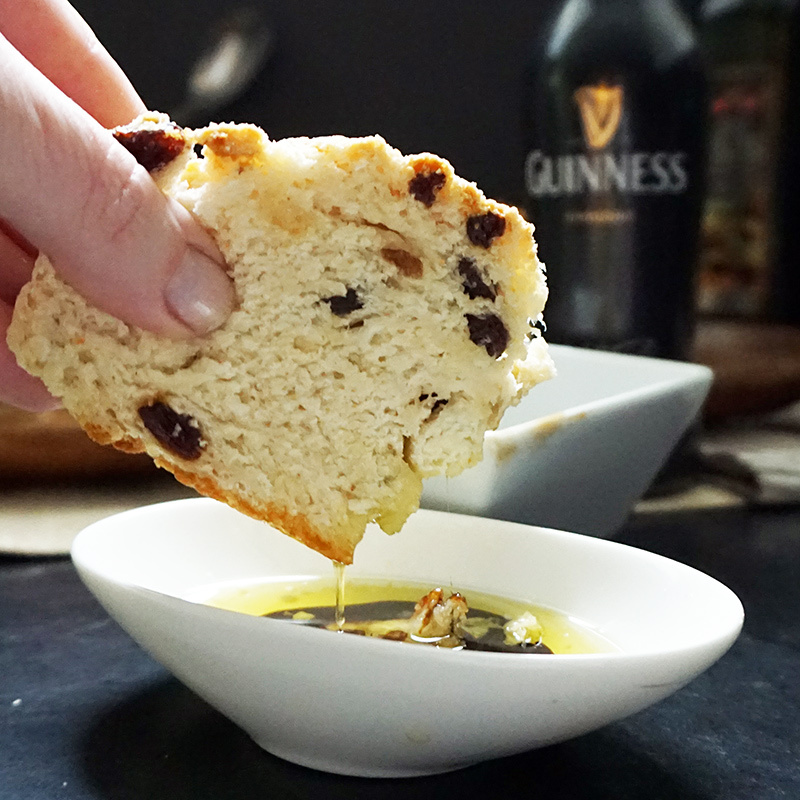 Make this Sweet Guinness reduction dipping sauce! 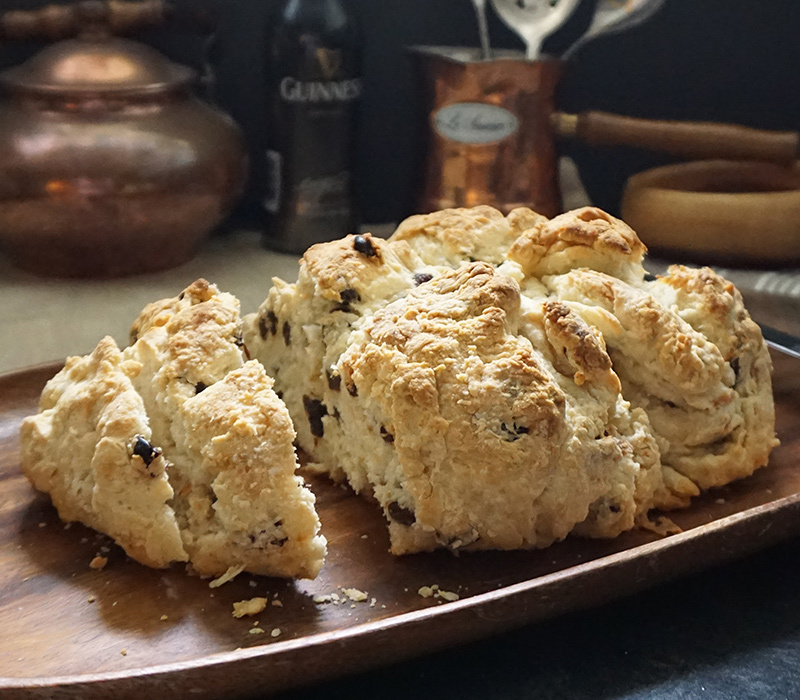 Irish soda bread is divine with a good, Irish butter like Kerry Gold, but I also made this sweet Guinness reduction dipping sauce to go along with it. Slice it and dip away! It definitely becomes dessert at that point. 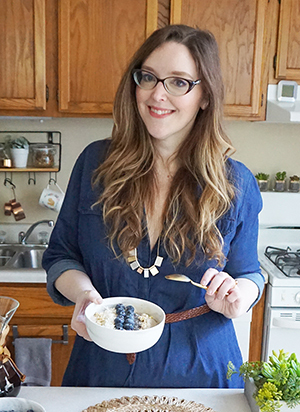 Whisk the flours, sugar, baking soda, cream of tartar, and salt together in a large bowl. Cut soft butter into small cubes and work it into the dry mixture with a dough blender, fork, or your fingertips until the texture resembles coarse, pea-sized crumbs. 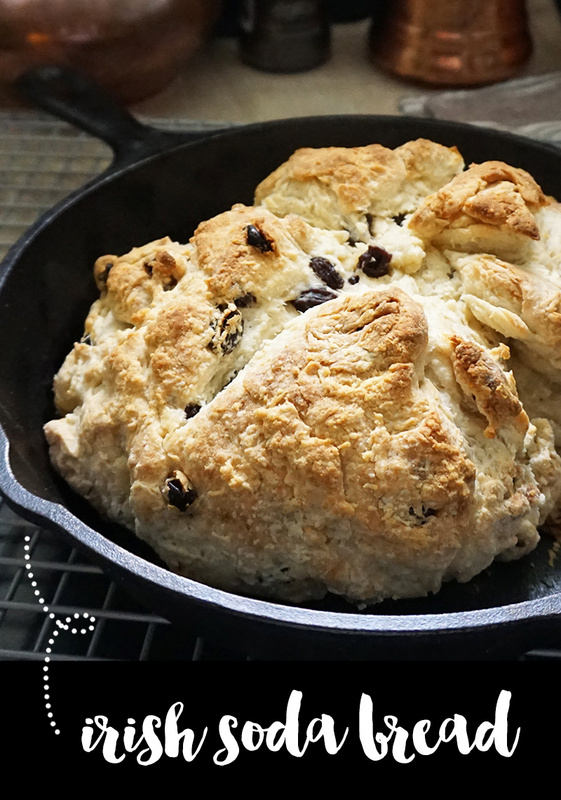 Add the buttermilk and raisins and stir with a fork just until the dough begins to come together. 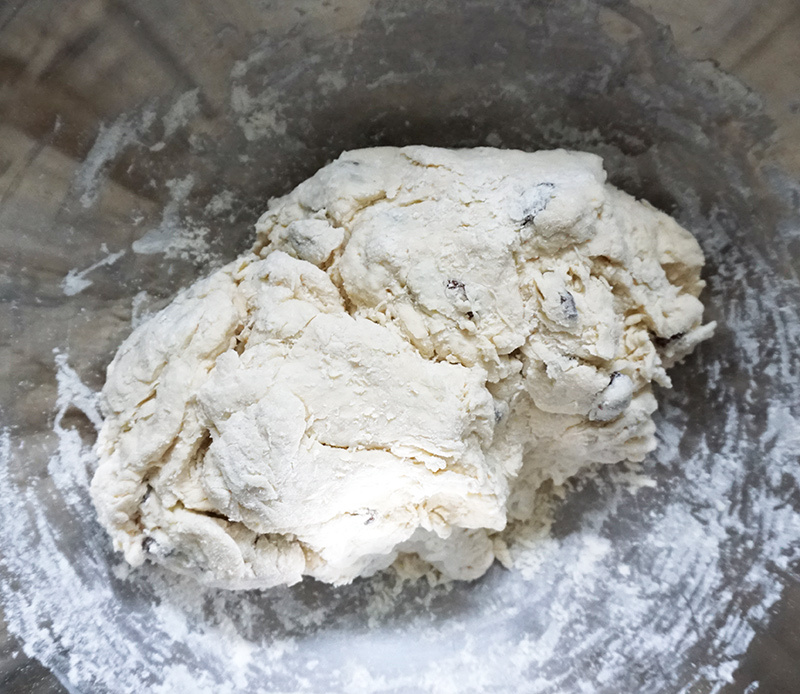 With your hands, turn the dough a few times until it mostly holds its shape. Don't work it until it's smooth or it will be tough after baking. 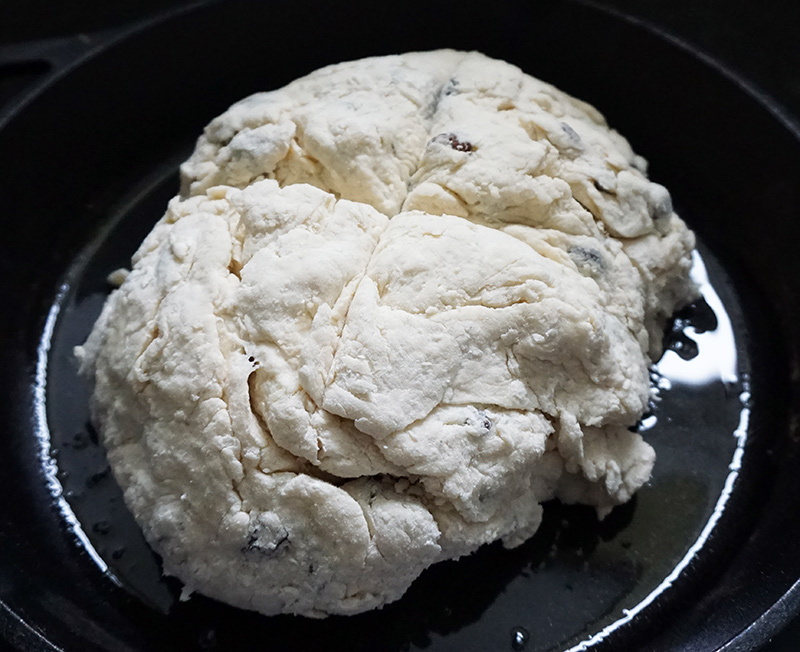 Form a ball about 8 inches in diameter and 2 inches high, and place on a well-greased cast iron skillet. 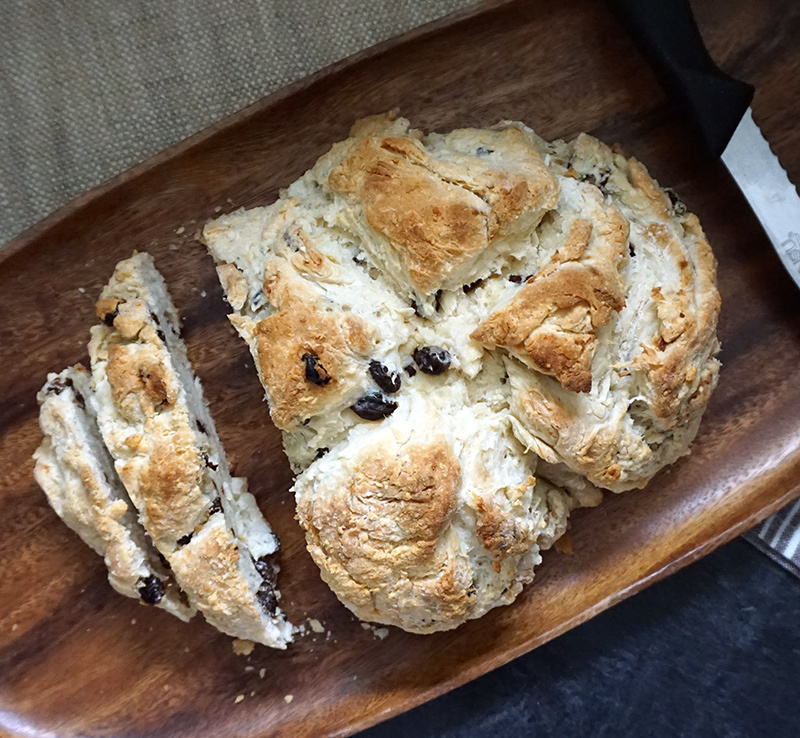 Score the dough with a chef's knife by cutting a cross shape on the top of the loaf. 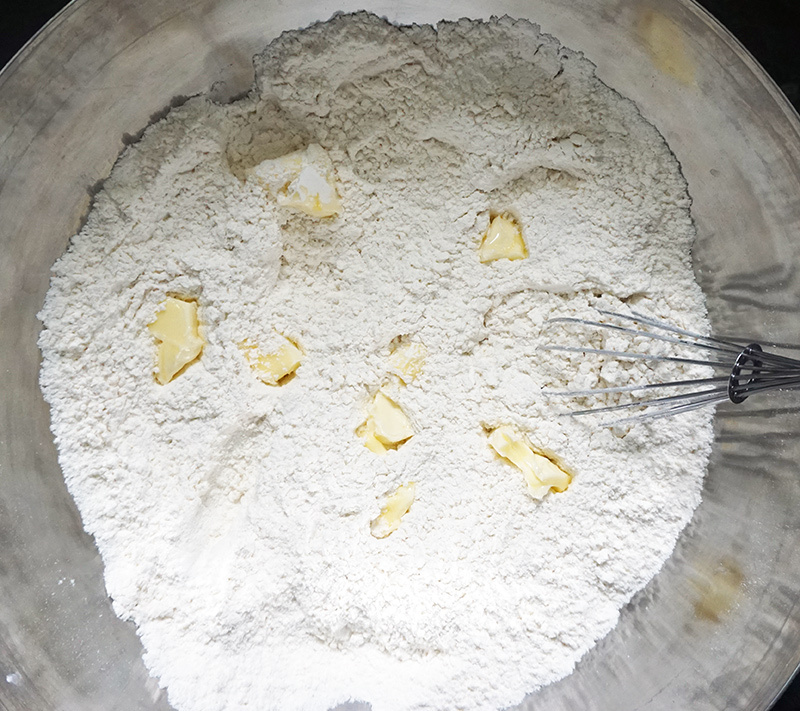 Brush on 1 Tbsp melted butter and dust the top with all-purpose flour. Bake until golden brown and a cake tester or knife inserted into the center comes out clean, about 40 minutes. Remove from the oven and cool to room temperature for about 30 minutes. 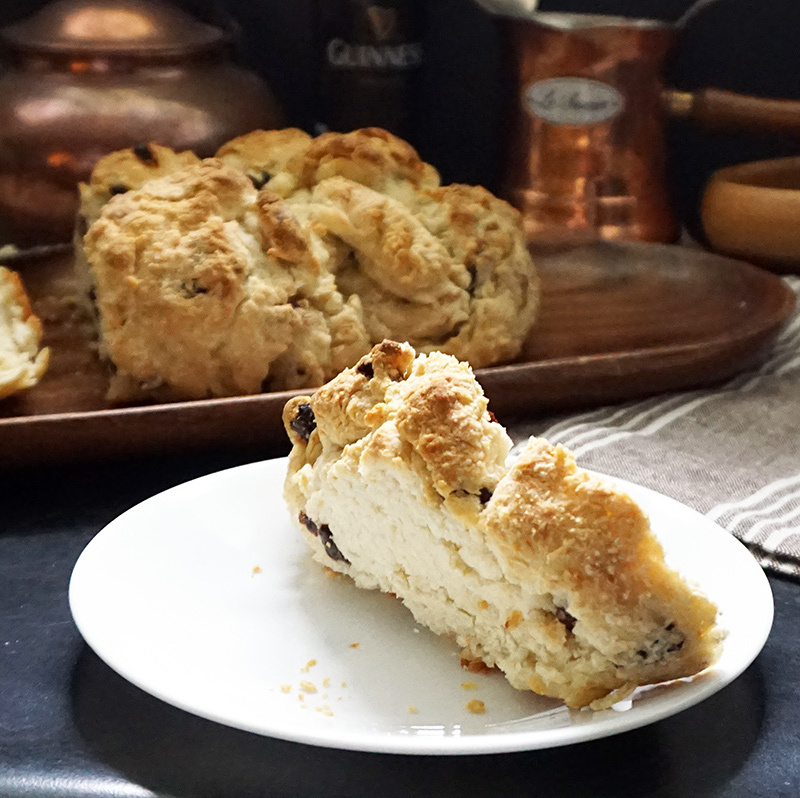 Serve with good, Irish butter and this sweet Guinness reduction sauce.